When properly used, the UDRP enables trademark owners to take control of abusive domain names. Yet sometimes the UDRP itself is misused by trademark owners to try to seize desirable domain names to which they have no legal entitlement. Is there a downside to misusing the UDRP to attempt a domain name hijacking? Unscrupulous companies at times misuse the UDRP by improperly invoking its power to compel a transfer of ownership in order to seize inherently valuable, non-infringing domain names that the companies desire for their own use. Many trademarks are comprised of common words, phrases or acronyms. The registration of common word, phrase or acronym domain names that may be similar to an existing trademark does not necessarily mean, therefore, that the registration was in bad faith, or targeted at that trademark, as there are many possible uses for such a domain name distinct from the use of any particular mark owner. Nevertheless, some mark owners will in effect claim exclusive commercial rights to such everyday terms by launching a complaint against a matching domain name, even in the absence of evidence that the domain name was used to target the complainant's mark. Examples of such domain names that have recently been targeted by complainants in a UDRP dispute include babyboom.com, cassandra.com, pinksheet.com, cwj.com, fairmarkets.com and weeds.com, amongst many others. Would-be domain name hijackers in such cases often use the similarity between their brand and the domain name as the basis for their complaint while concocting the more crucial UDRP allegations, namely that the domain name owner lacks a legitimate interest and that the domain name owner's registration and use of the domain name was in bad faith. These complaints fail to acknowledge that descriptive and generic domain names have inherent value and can be lawfully used in a non-infringing manner. The Panel is in agreement with Respondent and finds, on any construction of the facts, that Complainant knew or should have known that it was unable to prove trademark rights. Having regard to the evidence, the Panel also finds that there was material in the public domain to show Respondent's legitimate interest in the domain name and its bona fides more generally. Moreover, even if Complainant had not made those enquiries, the course of correspondence with Respondent made that plain. The fact alone that the Complaint was later filed in that knowledge is in the Panel's assessment evidence of the Complaint being brought in bad faith. Finally, the explicit claims to bad faith registration and use made in the Complaint are groundless and overstated in nature. The very nature of Respondent's registration evidences bad faith. Respondent has owned the Domain Name since 1999 and has never once had a functional page running. This leads to the conclusion that the Respondent registered the name to sell it one day to a company like that of the Complainant who has a real and legitimate use for the name, or just to prevent the owner of a trade mark or service mark from reflecting the mark in a corresponding domain name. In light of the above, the Panel agrees with the Respondent that the Complainant has filed the Complaint after an unsuccessful attempt to acquire the disputed domain name from the Respondent, and where the legally represented Complainant filed the Complaint without having any plausible basis for establishing, in particular, bad faith registration and use. In all the circumstances, the Panel makes a finding of reverse domain name hijacking against the Complainant. The complaints in the fairmarkets.com and cwj.com UDRP disputes were clear attempts to misuse the UDRP to hijack inherently valuable domain names to which the complainants had no legal entitlement and as a consequence they were found by the panelists to be abusive. Yet what penalty do the complainants in the fairmarkets.com and cwj.com disputes, and in other attempted hijackings, face when they are found guilty by the UDRP panel of abusing the process? The risk to the complainant of attempting a hijacking is that the UDRP panel may find it guilty of Reverse Domain Name Hijacking. According to the UDRP Rules, "Reverse Domain Name Hijacking means using the Policy in bad faith to attempt to deprive a registered domain-name holder of a domain name". RDNH is a sanction that has no obvious consequence beyond the censure itself, although it nevertheless does indeed have consequences, as explained herein. It has no financial penalty, nor does it bar a complainant or his or her attorney from making future UDRP filings. Some trademark owners and their attorneys therefore see little to fear from being found guilty of RDNH. With relatively "much to gain" and "little to lose", companies at times succumb to the temptation to file meritless complaints in the hopes of gaining a windfall transfer of a desirable domain name for free. Certain panelists who are concerned about misuse of the UDRP appear to be increasingly recognizing the importance of calling out such abuse where appropriate. These panelists are not tolerant of ill-founded complaints relying on a mark that was adopted long after the domain name was registered, or where a complainant has "unreasonably ignored established Policy precedent" or where a complainant bases "a complaint on only the barest of allegations without any supporting evidence." 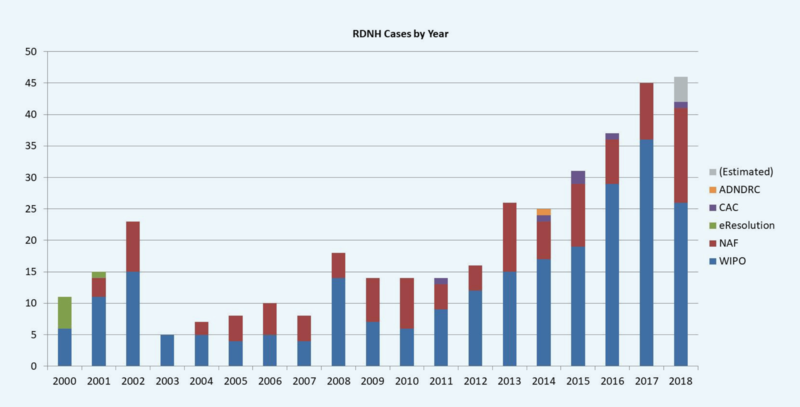 While only five RDNH findings were issued in 2003, by 2016, the number of RDNH findings had increased to 37, and increased again in 2017 to 45. 2018 is on pace to see a similar or higher number of RDNH findings. Source: RDNH.com, actual through November 2018, projected through year-end 2018. Although RDNH decisions represent a relatively small portion of the number of UDRP cases filed, the domain names targeted for hijacking are often significantly more valuable than the typically cybersquatted domains that are the subjects of most complaints. Although the UDRP does not impose any actual penalty on those found guilty of attempted Reverse Domain Name Hijacking beyond censure, an RDNH finding may nevertheless have significant consequences that result in reputational damage to the complainant and the complainant's counsel, and at times even financial costs to the complainant. A finding of RDNH therefore may indeed play a role in deterring frivolous filings. "[Complainant] took on the guise of a third rate barrack room lawyer and advanced arguments that were tortuously artificial in the extreme"
"the Complainant has failed miserably...the Complainant's filing [is] frivolous, abusive"
"the Panel deplores the fact that a baseless Complaint of this nature was filed." "The Complainant's blatant and intentional misrepresentation as described above constitutes a clear violation of [its certification of completeness and accuracy]." "a brash and totally unjustifiable attempt to pressure a domain name owner into releasing a legitimately held domain name"
"We owe it to this Respondent to chastise the Complainant and its representative for their irresponsible conduct. We owe it to the integrity of the UDRP process to call out patent abuses such as I believe this case to be." "a finding of abuse of the administrative proceeding is beyond obvious...the Complainant's empty rhetoric, mudslinging, and unsupported factual allegations require this Panel to impose the only sanction available to it." "the Panel does not need to make a finding as to whether or not the conduct of the Complainant and/or its representatives was deliberately dishonest, although it is of the view that the nature of the Complaint and the allegations it contains is, at the very least, extremely unsatisfactory." "The Complainant attempted to mislead the Panel on several occasions by presenting information as fact, which at closer examination was misleading or untrue." "The Panel notes that the Complainant, The Procter & Gamble Company, is a premier marketer and advertiser of consumer products in the United States of America and in many other countries… To have filed the Complaint at this relatively late date — more than eleven years after the registration of the disputed domain name and several years after its acquisition by the Respondent — seems a grotesquely unfair attempt to wrest ownership of the disputed domain name from the owner… This Complaint fell very far short of what the Panel was entitled to expect from a Complainant of this stature." It is lamentable that the Complainant's representative appears to have failed to address these concerns and thus has brought two cases under the Policy within a year in which there is a real prospect that it has either deliberately sought to mislead the panel or has been inexcusably careless in the manner in which it has pled its client's case. The Panel is unanimous that this deserves censure. Novagraaf Nederland subsequently filed another complaint that was found guilty of RDNH, bringing it increased notoriety. This raises the possibility that its future UDRP complaints would be viewed as suspect, such that it would be an ineffective advocate for its clients. Besides Novagraaf Nederland, other firms and attorneys have brought cases on more than one occasion which resulted in an RDNH finding, including Anand & Anand (whose managing partner is a WIPO panelist), Ballard Spahr, and Stobbs IP, and attorneys J. Dustin Howell of Workman Nydegger and Steven Rinehart. Since UDRP decisions do not always adequately explain each side's position, it may be that these firms and attorneys have a good explanation as to how the RDNH findings came about. Yet as a result of RDNH findings and any publicity related to them, potential clients researching an attorney or a firm prior to entering into an engagement may learn of an attorney's or a firm's involvement in an abusive filing and may choose not to move forward with the engagement. Domain name owners on the receiving end of abusive complaints have at times publicized the bad behavior of those bringing the complaints. The website at HallofShame.com highlights many well-known complainants, including Land Rover and Procter & Gamble, that have been found guilty of RDNH, as well as the law firms that brought the RDNH complaints. A few domain names targeted by complainants now alert visitors to the complainants' attempted hijacking attempts as with Queen.com, QLP.com and Xpand.com. Such negative references can appear in search results for a complainant or its counsel and may supplant good news such that the company and its counsel appear in an unfavorable light. Many complainants, and even some intellectual property attorneys, are not aware that attempted Reverse Domain Name Hijacking is also a violation of the U.S. Anti-Cybersquatting Consumer Protection Act (ACPA). The ACPA provides recourse for domain registrants improperly accused of cybersquatting in the form of two distinct claims: (1) relief for registrants based a finding of "no bad faith intent"; and (2) relief based on a finding of RDNH. An aggrieved domain owner can request a judgment from a U.S. federal court for a declaration of no cybersquatting as well as payment of damages and attorney's fees. At least one federal court has found that the ACPA's statutory damages penalty of $100,000 may be assessed against parties who have engaged in RDNH, and numerous courts have awarded actual damages and attorney's fees for RDNH. Companies that have filed misleading UDRP complaints have been surprised to find themselves sued in U.S. federal court and forced to defend RDNH claims, including demands for significant monetary payments and attorney's fees. A UDRP complaint filed against airzone.com, for example, resulted in the Spanish complainant being sued in U.S. federal court on multiple claims, including that it violated the RDNH provision of ACPA. The lawsuit concluded with a $40,000 judgment against the UDRP complainant and a court determination that the UDRP respondent would retain the domain name. Similarly, a UDRP complaint filed against sdt.com led to a federal lawsuit that concluded with a judgment against the Belgian UDRP complainant for $50,000 and a determination that the UDRP respondent would retain the domain name. Even if a Complainant gets "lucky" and appears to succeed with its hijacking attempt when it is awarded a domain by a UDRP panel based upon a meritless complaint, the respondent may still file a suit in federal court claiming damages for RDNH as defined under the ACPA. In the AustinPain.com dispute, the complainant obtained a transfer order from the UDRP panel, yet the respondent challenged the transfer in federal court, and counter-claimed against the complainant by alleging RDNH under ACPA. The complainant paid $25,000 to settle the lawsuit despite prevailing in the UDRP. The complainant's attorney generally bears responsibility for filing a complaint that results in RDNH, as the client relies on his or her legal advice and agreement to file on a client's behalf. When an attorney recognizes it is possible to make a "colorable" claim under the UDRP to demand the transfer of a desirable domain even in the absence of adequate evidence to support the claim, the temptation to misuse the UDRP can be great. we both are aware of the attorney´s professional interests do not always match our business targets… The truth is, all this mixture of unfortunate events is a nightmare for me and my company and all I want is to close it as soon as possible with minimum damage to our business. The complainant's attorney is an important gatekeeper who should remain vigilant in avoiding an embarrassing RDNH ruling which may risk the wrath of his or her client and may result in the loss of the client. A prudent attorney therefore will decline to file a complaint that lacks merit or misrepresents facts to spare the client the risk of reputational damage and potential exposure to substantial legal fees and financial penalties. RDNH findings play a key role in maintaining the integrity of the UDRP. The RDNH provisions of the UDRP, as well as the possibility of an RDNH finding under the ACPA, should be seen as a disincentive to bring meritless complaints and thereby abuse an otherwise respected procedure. Making RDNH findings, where warranted, is therefore critical to supporting the integrity of the Policy. Some panelists will too readily excuse blatant hijacking attempts as merely "misconceived" or the result of "misapprehension" on the part of the "misguided" complainant, or because the complainant was self-represented and had first "made a reasonable offer of USD 3,000 to purchase the domain name". While calling out abuse of the Policy is an important responsibility of a UDRP panelist, making and supporting an RDNH finding requires extra time and effort for which the panelist receives no additional compensation. An RDNH finding may also come at a social cost to the panelist, for the complainant's counsel may be an acquaintance of the panelist, or at other times a fellow UDRP panelist. Those UDRP panelists who nevertheless admirably fulfill their duty to consider and to make, when appropriate, an RDNH finding, deserve particular commendation. The integrity of the UDRP depends on calling out abuse both of the cybersquatting variety and of the RDNH variety. Those panelists who make RDNH findings when deserved help bolster the UDRP's reputation as a generally effective dispenser of justice. Even when an RDNH finding appears relatively inconsequential, it may lead to serious repercussions, and may perhaps even serve as a deterrent to further abuse of the UDRP. This article is the product of collaboration between ICA Board Member, Nat Cohen and Zak Muscovitch. Pursuant to Rule 15(e) of the Rules, "if after considering the submissions the Panel finds that the complaint was brought in bad faith, for example in an attempt at Reverse Domain Name Hijacking or was brought primarily to harass the domain-name holder, the Panel shall declare in its decision that the complaint was brought in bad faith and constitutes an abuse of the administrative proceeding"
 See WIPO Jurisprudential Overview 3.0 (https://www.wipo.int/amc/en/domains/search/overview3.0/#item416). WIPO's updated overview released in 2017 provides a more robust treatment of RDNH than previous versions. The criteria for RDNH under ACPA are different than the guidelines for finding RDNH under the UDRP. For instance, intentional misrepresentation is an element of an RDNH finding under ACPA, but is not required for an RDNH finding under the UDRP. Walter v. Ville de Paris, 09-cv-3939 [Doc. 31] (S.D. Tex. Sept. 14, 2012) (awarding $100,000 in statutory damages for RDNH after the filing of a baseless UDRP complaint); AIRFX.com v. AirFX LLC, 2:11-cv-01064 [Doc. 121] (D. Ariz. Mar. 7, 2013) (awarding $103,972.50 in attorney's fees for RDNH); GoForIt Ent. LLC v. Digimedia.com, 3:08-cv-02011 [Doc. 147] (N.D. Tex. Mar. 22, 2011) (awarding $55,000 in damages and $48,000 in attorney's fees for reverse domain name hijacking). Telepathy, Inc. v. Corporacion Empresarial Altra S.L., No. 1:17-cv-1030 [Dkt. No. 10] (D.D.C. Nov. 28, 2017). See Telepathy, Inc. v. SDT Int'l SA-NV, No. 1:14-cv-1912 [Dkt. No. 12] (D.D.C. July 9, 2015). HugeDomains.com, LLC v. Robert P. Wills, M.D., P.A., 14-cv-00946-BNB [Doc. 23] (D. Colo. July 21, 2014). Private correspondence, not publicly available. See Shoeland.com - http://www.adrforum.com/domaindecisions/1255365.htm, "The Panel is of the opinion that Complainant has satisfied Policy ¶ 4(a)(i). Therefore, the Panel finds that Complainant has not engaged in reverse domain name hijacking." and see Panelist Neil Brown's dissent. "Yet as a result of RDNH findings and any publicity related to them, potential clients researching an attorney or a firm prior to entering into an engagement may learn of an attorney's or a firm's involvement in an abusive filing and may choose not to move forward with the engagement." I'm not so sure about that bit in an otherwise bang-on piece. There have been a couple of times over the years where I have been asked to consult on filing a UDRP proceeding, have informed the client that on the facts I could not in good conscience take their money on a meritless case, and the client has found counsel with a different conscience-per-dollar ratio. They end up wasting even more money that way, but there is certainly a market in the type of legal counsel which consists of charging people to tell them they want to hear, instead of what you really think. It's tough to figure out, on balance, whether the bulk of RDNH cases are lawyer-driven or client-driven, though. As you point out, there seem to be certain firms who are frequent fliers - and UDRP cases are only the visible tip of the iceberg as Zak or anyone else knows, who regularly sees the garden variety "why not send a c&d;letter anyway" threats or the frequently entertaining results of automated c&d;generation systems. An enterprising associate at a large firm can certainly keep busy by alerting the firm's clients to "problems" they didn't know they had, and that associate is just as likely to be handed the thankless task of ginning up a creative UDRP filing on bad facts on behalf of one of the firm's mainstay clients when told to do so by a partner. It's certainly understandable that the ideal of exercising independent professional judgment is challenging in that circumstance, but one might at least write it up and get that partner to sign off on it instead of taking that bullet on an internet which doesn't forget. Your point is indeed very well taken, John! Many thanks, and thank you for contributing your insightful observations and sublime wit as per usual!